Milky chocolate is very popular along us. 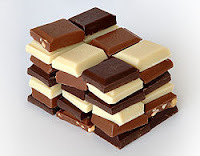 Everybody love chocolates because it is some kind of pleasure to eat chocolate... So today our topic is milky chocolate and its ingredients, components..
Sugar, cocoa butter, whole milk powder, cocoa mass, whey powder, emulsifier, artificial flavour. Alleryg statement : it may contain soy product. May contain traces of hazelnuts, peanuts. Chocolate cocoa solids minimum 30 %. please keep away heat, odour, damp your chocolate.